SAN DIEGO, CA. Hundreds of people gathered at 6th Ave and Laurel late this afternoon to protest today’s California Supreme Court decision upholding Prop 8. By time the crowd hit the street to march downtown to the Courthouse, it had swelled to 2,000. Organizers plot their next move. It was a large – even huge-, friendly and boisterous crowd. Everyone seemed to be in good spirits, despite the reason for the protest. A helicopter clattered overhead, as people streamed in, some with signs and a few with banners. Plenty of police and TV stations were on hand to greet everyone. 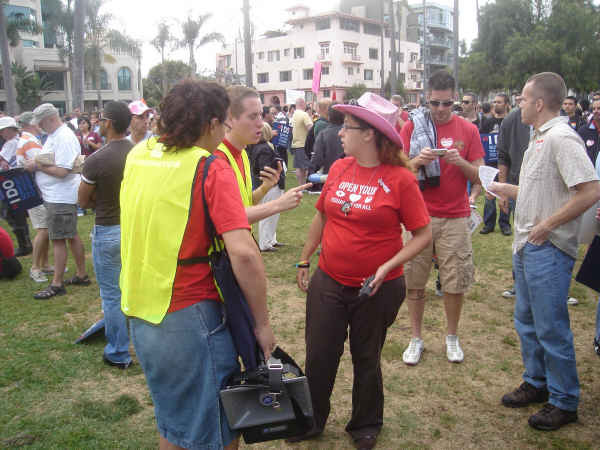 The rally and march had been called by a coalition called the Marriage of the Minds, which is made up of three groups: the San Diego Alliance for Marriage Equality, the San Diego Equality Campaign, and Marriage Equality USA. The milling and standing crowd was urged to be peaceful by a small group of roving people with a bullhorn. They needn’t have worried, as the mood of the crowd was upbeat. No sign of counter-demonstrators. 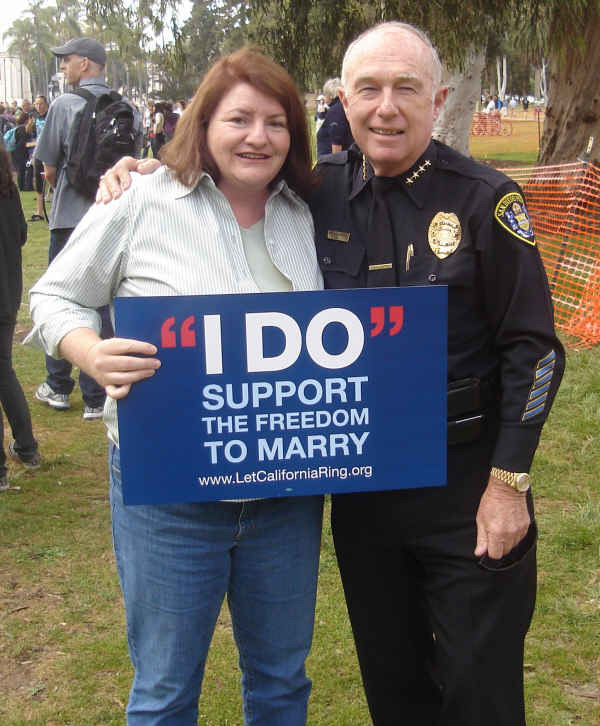 Former City Councilmember Toni Atkins and Police Chief Lansdowne. Noticing Police Chief Landsdowne on the edge of the rally, I sauntered over and asked him a few questions. While I was there, former City councilmember Toni Atkins joined us. She hugged the Chief and asked me for our blog’s address. The Chief did not expect any problems at the protest, he told me. His force was going to try to keep the marchers only on one half of the street. At that point, the Chief estimated the crowd at 1500. He had no idea, also he said in response to my query, what proportion of his officers were gay or lesbian. And he agreed that these days, relations between gays and the police were quite different than they were back during the days of Chief Ray Hoobler – who had instigated a reign of terror against gays during the late sixties and early seventies. I asked the Chief if his troops were going to have to deal with a planned sit-in at the County Admin Building tomorrow, May 27th. People had been handing out leaflets announcing the event. He said because the protest was inside the County Building, the Sheriffs would have jurisdiction. Councilmember Todd Gloria marched at the front with the main banner. Everyone was all smiles and happy. It was a celebration just to be all together. And marching down the avenue. Excitement was in the air, not tension. They headed down the street, and I headed back to my car. I had heard that Mayor Sanders was a key note speaker at the rally downtown. I did hear people talk about tomorrow – the planned sit-in at the County. That should be exciting. Noon. This ain’t over yet. I’ve always thought that San Diego was a fairly complacent town. It’s good to see a strong (yet peaceful) response to a law that is impossible to justify without factoring in fear and ignorance. This isn’t over yet. I wonder how the next chapter will play out. Way to go Frank, way to go San Diego! Nice work! Glad to see such a massive turnout. In SAN DIEGO! apparently the crowd grew as the march headed downtown. later estimates pegged the crowd at 3500.
great reporting frank. I know its not easy for you being all the way out in LG – you are truly committed to reporting on political actions that are stigmatized by mainstream media outlets! Thanks Doug, I was going to add that but ya beat me to it. Good job. My estimate of 2000 was achieved by me sitting on the sidelines and doing a straight count of every 10 people. Iffy, true, but I bet it’s good to the nearest 100 people. 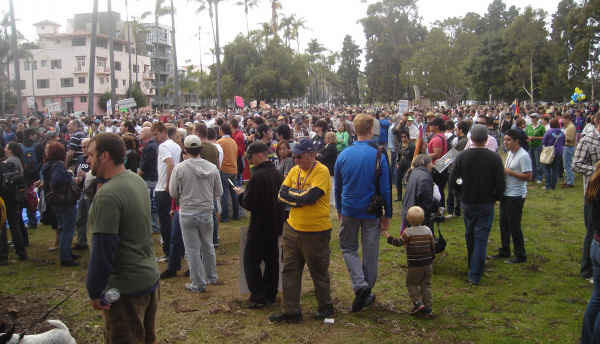 Even though the rally and march had been planned, it was still a good turn-out for San Diego. You rock Frank, nice work!! !